What did a woman in history do when she had no control over her life? If strong and empowered, she rebelled. Sometimes in a big way, and sometimes as a detriment to herself. One such woman was Elisabeth, Empress of Austria. Born, Her Royal Highness Duchess Elisabeth Amalie Eugenie, in Munich, Bavaria 1837, Elisabeth grew up in the Bavarian countryside far from court life, riding horses and pursuing country sports. 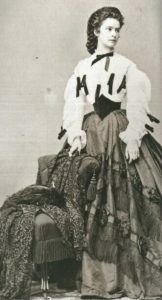 Her parents, Duke Maximilian Joseph and Princess Ludovika of Bavaria, saw little merit in rules for their four children. This liberal upbringing set the stage for Elisabeth’s constant quest for individualism in her adulthood. One that proved more and more difficult as she grew older. And it started with marriage. Indulgent with their children’s freedom in childhood, the Duke and Princess of Bavaria could no longer defy the rules of royal life when their children became young adults. 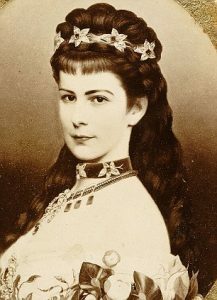 The Duke and his wife made arrangements with the Duke’s sister, Princess Sophie of Austria, for their eldest daughter, Helene, and Princess Sophie’s son, Franz Joseph, to wed. Fifteen-year-old Elisabeth accompanied her older sister and their mother to Austria to meet their cousin and his mother. However, Helene did not catch the young Emperor’s fancy, but Elisabeth did. Franz defied his mother and insisted he marry Elisabeth. Their betrothal was announced five days later. Within the year, Elisabeth gave birth to the couple’s first child, Sophie. The Archduchess immediately whisked the child away from Elisabeth and put her in the control of her own nannies. The same followed suit with the next child, Gisela. The Archduchess never missed an opportunity to chide Elisabeth for not producing a son. Eager to get away from her mother-in-law, Elisabeth implored her husband to let her and the two girls accompany him on a trip to Hungary in 1857. During the visit, both of the girls became ill with diarrhea. Gisela recovered quickly, but two-year-old Sophie succumbed to the illness, later diagnosed as Typhus. 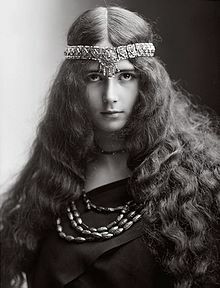 The death of little Sophie sank Elisabeth into a depression which would reoccur and haunt her for the rest of her life. Heart-broken, Elisabeth began a cycle of fasting, sometimes for days on end. 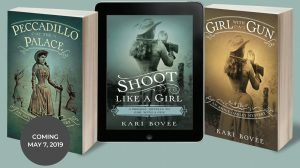 She shunned her responsibilities at court, spent much of her time outdoors riding her horses, and also developed some disturbing phobias and obsessions. Her marriage, not a panacea to her troubles, started to show signs of stress. 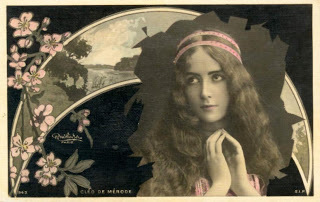 Known as a great beauty, Elisabeth took much pride in her looks. Her appearance, one of the few things she had control over, became her primary obsession. Known for her elegant height of 5’8”, and her tiny waist, measuring 19 inches in diameter, Elisabeth went to dangerous extremes to control her weight. She eventually whittled her waist down to 16 inches. She weighed herself daily, and if the scales tipped above 110 lbs., the next several days called for a strict fast. In addition to extreme dieting, Elisabeth also developed a rigorous and disciplined exercise routine. She had gymnasiums built in every castle where the royal family resided. She had mats and balance beams and mirrors installed in her bedchamber so she could practice on them each day. She rode her horses often, sometimes three to five hours at a time. Despite the toll on her health, in 1858, Elisabeth finally bore a son and heir, much to everyone’s relief. Liberal and forward thinking, Elisabeth’s interest in politics grew. Having fallen in love with the Hungarian people during her visit there in 1857, she firmly placed herself on the Hungarian side in Austro-Hungarian negotiations. At one point, she demanded that her husband name Gyula Andrassy, a liberal Hungarian statesman, (and rumored to be her lover) Premier of Hungary or she would leave him. The emperor complied and Elisabeth stayed in an increasingly unhappy marriage. In 1867, The Austro-Hungarian Compromise resulted in Andrassy becoming Prime Minister of Hungary, and Franz Joseph and Elisabeth, King and Queen of Hungary. The couple was gifted with a palace in Godollo, and set up a country residence there where Elisabeth built a riding school. Elisabeth much preferred Hungary to Austria and rarely went back to Vienna. In 1868, she gave birth to another daughter, Archduchess Marie Valerie. Determined to raise this child herself, she openly rebelled against her mother-in-law. Soon after, Archduchess Sophie died, forever losing the power to control her son, his wife and their children. But, too much damage had been done, and Elisabeth had no desire to be a doting wife. She took up a life of traveling, leaving her husband and children at home. More sadness befell the estranged couple years later when their only son and heir, Rudolf, was found dead with his 17-year-old mistress, Baroness Mary Vetsera, in a supposed murder suicide pact. The death of Rudolf caused a lasting rift between Elisabeth and Franz, Hungary, and Austria. The line of succession now passed to Franz Joseph’s brother, leaving Hungary out of the picture. In perpetual mourning, the Empress Elisabeth continued her travels. When her health prevented her from riding, she made her servants endure long hikes and walks with her. At fifty, she took up fencing with the same intensity as she had other sports. She also threw herself into writing, became an inspired poet, and wrote nearly five hundred pages of verse. She despised court life and would often travel in disguise, without her entourage, to avoid being recognized. Unfortunately, this decision ultimately led to her death. 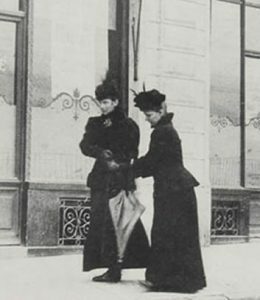 In 1898, Elisabeth and her lady-in-waiting left a hotel on the shore of Lake Geneva on foot to catch a steamship for Montreux. Wanting to avoid recognition, she ordered her servants to travel ahead by train. Luigi Lucheni, an Italian anarchist, happened to be in town to kill the Duc D’Orleans. 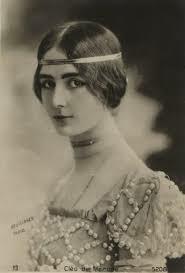 Failing to find him, Lucheni learned that a woman traveling under the name “Countess of Hohenembs” had exited the hotel. Determined to kill a sovereign, Lucheni stabbed her under the breast with a hand-made needle file. Defying the rules to the end, but beloved by her people, Empress Elisabeth of Austria became an historical icon. Her limited, though significant, influence on Austro-Hungarian politics temporarily soothed a troubled empire. Although unable to completely escape the binds of royal life, she will always be remembered as a liberal non-conformist who valued freedom and the rights of the individual above anything else.